Virginia Baily, an English debut author, has penned a heart-touching tale of family love in her book, Early One Morning which unfolds the the story of a woman living in Rome during the WWII, who faces the consequences of saving a Jew child from being sent to the concentration camp with his family. With years to come by, this woman's life grips the readers with the pain that was caused by this child. Chiara's life changes forever when she rescues a young boy named, Daniele from the clutches of the Nazi army by making a silent bond of promise with her eyes with the boy's mother. Chiara was all set to flee Rome with her younger sister, Cecilia, when Daniele came under Chiara's care. Three decades passes by, when Chiara has to confront the truth when a woman named, maria, calls her to say that she is her granddaughter and has to accept what Daniele did to her for over all those years. The story is breathtaking, yet thoroughly heartbreaking, as the author offers her readers with an honest tale of love and redemption as well as forgiveness. The story is laced with so many deep painful emotions that it is bound to bring a tear into the eyes of the readers as they get delved deeper into Chiara's past with Daniele. The author has meticulously captured the landscape of Rome both in the year of 1973 as well as during the WWII period. The author has offered her readers with a lush, rich captivating background along with its changing era. Yes the novel is bound to make the readers feel like they are teleported to a different time period as well as to an evocative location. With a shifting timeline, the author has no only vividly painted the background of Rome into her story but has also gripped the major political changes in the society. The author's writing style is good, yet not brilliant, but enough to make the readers feel for the characters. The narrative is also not that engaging enough unlike its story. But what keeps the readers glued till the end is the heartache of Chiara through all those years with a shifting timeline from the year 1973 to 1943-44. The pacing is moderate as the story has lot of layers that unfold gradually with the story. The characters are extremely well-developed and inspired from reality. The main character, Chiara, will make the readers root for her and for her story. Chiara is an unique woman who showed unusual bravery during the war by rescuing a boy from his helpless mother and keeping up with his bad habits as the boy travels on a downward spiral road to self-destruction. Chiara's decision leaves her with worst consequences for that her sister too has to suffer. The supporting characters are also well-etched out. 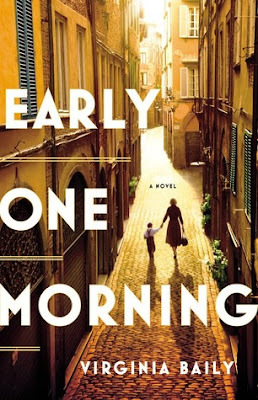 Verdict: A compelling historical fiction set in Rome during the WWII period. Courtesy: Thanks to the author, Virginia Baily, for giving me an opportunity to read and review her novel. came out in the UK this summer. Set in Rome in the 1940s and 1970s, it is “fearless, witty and full of flair” (The Guardian) and “as gripping as any thriller” (Daily Mail). It was Waterstones, Goldsboro Books and Hatchards' ‘Book of the Month’ in August, hit the Sunday Times bestseller list that month and was dramatized on BBC Radio 4 in October. It was published in the US in late September, Holland in October and is being translated into 10 other languages. My short stories and poetry have been widely anthologized. I'm the co-founder and editor of Riptide short story journal, based in Exeter. I'm also the editor of the Africa Research Bulletin. I am represented by Nicola Barr at Greene & Heaton agency.